White Buffalos battle through injuries, foul trouble to finish 1-2 at Les Schwab Oregon Holiday Hoops Fest. The Madras boys basketball team was not at full strength by the third day of the Les Schwab Oregon Holiday Hoops Fest in Bend. Three games in as many days took its toll on the White Buffalos. They lost two players to injury in a Friday night win against Ridgeview, and lost another, Dapri Miller, in the first half of Saturday's game, a 78-67 loss to 6A Grants Pass. With those three injured players — Miller, Tyler Lockey and Chad Thurby — watching from the bench, the remaining eight put up a fight. Grants Pass committed 13 turnovers in the first quarter, a majority of which Madras forced, which allowed the Buffs to take a 15-14 lead after one quarter. That lead increased to as much as eight in the second quarter, as a Miller 3-pointer and layup, plus two made free throws from Donnie Bagley, put Madras up 28-20. 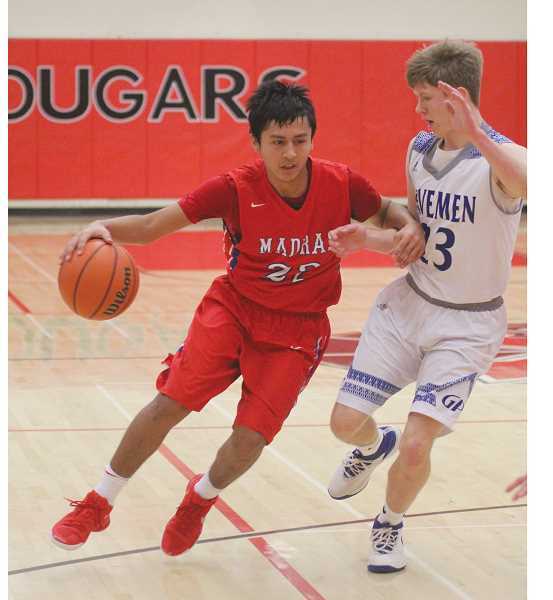 But a combination of Madras foul trouble and fatigue, a natural result of only having eight players available, began to show when Grants Pass came back to within one, 32-31, at halftime. "With eight guys it's tough," Madras head coach Evan Brown said. "On the other hand, they kept playing. They kept at it and kept flying around defensively. For us to be successful, that has to happen." The Buffs' backcourt pressure continued into the third quarter, when Kanim Smith, who led Madras with 23 points, nabbed two steals and scored on three straight Madras possessions, including a thunderous one-handed dunk. A 38-35 lead went south soon after, however, when Grants Pass grabbed a 50-49 lead with 1:53 remaining in the quarter. Madras played from behind the rest of the game. Although Madras ended the tournament 1-2, with a 3-8 overall record for the season, the team is pleased with its effort. That wasn't the case Thursday, in a blowout, 102-56 loss to Summit in which the Storm broke a team record for points scored. But the Buffs responded with a 90-80 win over Ridgeview the following afternoon. Madras led 69-60 heading into the final quarter, but halfway through, with a combination of injuries and four players fouling out, Ridgeview came to within three points. The Buffs were left with only five players for the remaining four minutes, all of them first-year varsity players, though they weren't rattled. It was a much-needed victory for a Madras team that likely feels it is better than its record indicates. "We've let a couple of them get away, but we've played some pretty darn good teams, too," Brown said. "As long as we're playing good basketball in league play, that's what we're after." 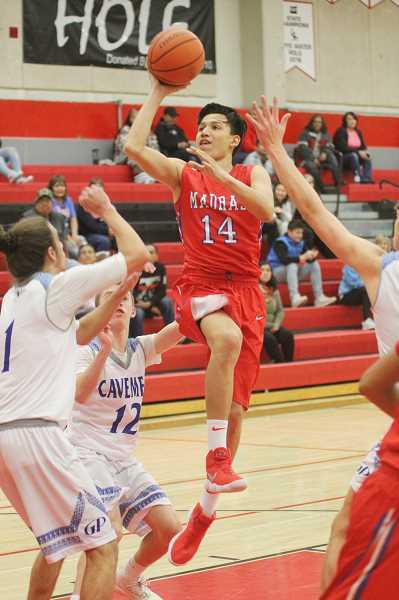 The Buffs have two nonleague games remaining, at Mountain View Jan. 5, and home versus Sisters Jan. 9, before they open their Tri-Valley Conference schedule against Molalla Jan. 16.